Since June 1967, the Israeli military has demolished more than 48,000 Palestinian homes and other structures such as schools, water purification facilities and electricity infrastructure. At the same time, Israel continues to allow illegal settlement construction on land on which Palestinians are forbidden from building. Dublin city centre shoppers were greeted with a strange sight yesterday afternoon (Thursday 15 June) as Trócaire activists staged a scene, entitled ‘A Home Truth’, depicting the plight of Palestinian families who are forced to leave their homes within minutes of them being demolished by the Israeli military. The installation, organised by Trócaire campaigns officer Emmet Sheerin, was on show in South King Street between 10 am and 3.30 pm. It is aimed at raising awareness among the Irish public about the reality of home demolitions in the Palestinian territories, which Israel has illegally occupied for 50 years. At present, Israel denies Palestinians the ability to build homes in 60 per cent of the West Bank, even though it is one of the most densely populated places in the world. Currently, the West Bank has a population of 1.7m on an area of 565 square kilometres, or 3,009 people per square kilometre; in comparison, the Republic of Ireland has 4.6m people living on an area of 70,273 square kilometres, or 66 people per square kilometre. Since June 1967, the Israeli military has demolished more than 48,000 Palestinian homes and other structures such as schools, water purification facilities and electricity infrastructure. At the same time, Israel continues to allow illegal settlement construction on land on which Palestinians are forbidden to build. 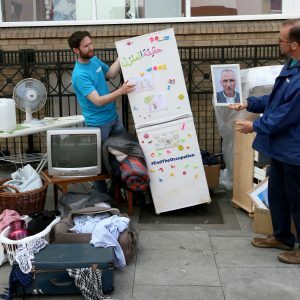 Among the household items on display were a fridge which, when opened, showed films depicting the plight of the Palestinian people, plus facts and figures relating to the ongoing occupation of Palestinian land. The fridge also hosts a Lego representation of a house demolition. The use of children’s toys to illustrate a demolition was deliberately chosen to highlight the impact demolitions are having on the very youngest Palestinians. The installation is linked with a Trócaire campaign calling for an end to the 50-year occupation of the Palestinian territories. Trócaire, the Irish bishops’ overseas aid agency, would like to take the Home Truth installation to other parts of Ireland over the coming weeks. If you belong to a justice and peace group or a youth group that would be interested in bringing the installation to your parish, please contact Trócaire, but be aware that you may have to fundraise to cover the logistical cost of bringing the show to your locality. Trócaire also has a documentary video about Palestine that is available to be shown to parish groups, with speakers from the aid agency willing to travel across the country to spread the scandalous story of how the Palestinian people are being treated by the Israeli state. You can support the campaign, and call on the Irish government to recognise Palestinian national independence, by signing the online petition at https://www.trocaire.org/getinvolved/endtheoccupation.